PARIS—French authorities warned another wave of “great violence” and rioting could be unleashed in Paris this weekend by some “yellow vest” protesters, as senior ministers sought to defuse public anger with conciliatory languages on taxes. 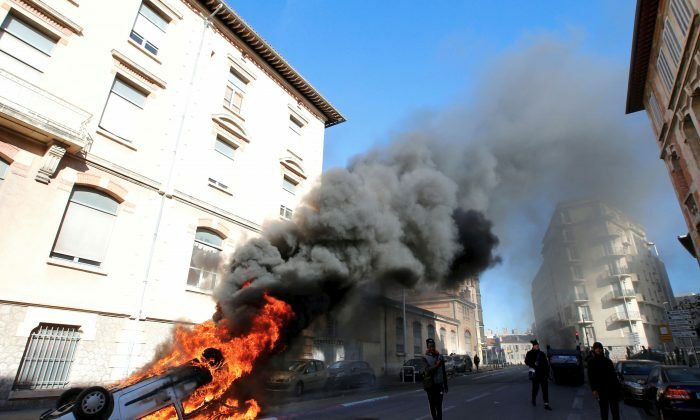 Rioters torched cars, vandalized cafes, looted shops, and sprayed anti-Macron graffiti across some of Paris’s most affluent districts, even defacing the Arc de Triomphe. Scores of people were hurt and hundreds arrested in battles with police. In a bid to defuse the three-week crisis, Philippe had told parliament late on Dec. 5 that he was scrapping the fuel-tax increases planned for 2019, having announced a six-month suspension the day before. The threat of more violence poses a security nightmare for the authorities, who make a distinction between peaceful “yellow vest” protesters and violent groups, looters from the deprived suburbs who they say have infiltrated the movement. On Facebook groups and across social media, the yellow vests are calling for an “Act IV,” a reference to what would be a fourth weekend of disorder. Several top-league soccer matches on Dec. 8 have been canceled and the Louvre museum said it and others were awaiting word from Paris officials on whether to close their doors. Their demands are diverse and include lower taxes, higher salaries, and Macron’s resignation.